On this particular day however, it’s not just the colors of the blooming tulips, daffodils, & delicate lacy cherry trees that are inspiring me. In fact, just driving past a bunch of balloons announcing an open house on my way home this morning, and then catching the new Target ad with the acrobats descending from a hot air balloon to “color our world” sent my soul soaring :-). While I have always admired women who carry off the classic monochromatic beige or white ensemble (think Diane Keaton), my style has always been more …out there. Nothing lifts my spirits like a sunny yellow top or a raspberry handbag! In my view, bright bold color belongs everywhere- just as we find it in nature. Seriously, what fun is a beige car? beige walls? beige food on a plate? And where would we be without the colorful people who explore, invent, create, amuse, and just plain make a statement? I’ll never forget the advice from acting teacher (Michael Shurtleff) who warned us about boring, uninteresting performances when we took no risks and “played vanilla” on stage. Can’t we also just as easily live boring, uninteresting BEIGE-filled lives? What a waste of the unique gifts each one of us was given to share with the world! Now I know there are those who are afraid to stand out… afraid to be noticed; but if I could encourage you to add even a little “splash of color”… We all miss out whenever one of us chooses to live a life in which s/he settles for blending in, and never “pops” with the special something s/he was meant to share with the world. Color is about surprise, excitement, joy- a feast for the senses. We laugh at a clown’s red nose, admire the dense multi-colored plumes of a peacock, and feel refreshed under the cool green canopy of leafy trees. 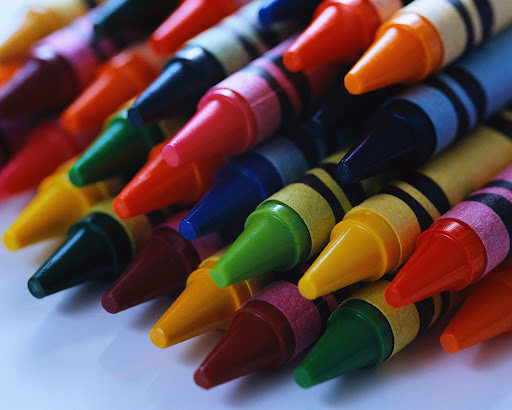 Granted, we might not all appreciate the giant, 84 colors to a box kind of crayon set, but even with just a few crayons, great beauty, and variety, and a richness follow :-).